Join us for four days of complete immersion in the real lives of the Bloomsbury set, in the South Downs home of Maynard Keynes and Lydia Lopokova. This unique retreat at Tilton House offers a rare opportunity to sleep, eat, breathe, explore, discover and grow exactly as the Bloomsbury set did, in the only Bloomsbury house to offer a residential escape. Walk in their footsteps over the Downs, sleep in their bedrooms, talk until the small hours in their fireside library, and feast on food from their recipe books in the same kitchen that hosted countless candlelit gatherings. Your absorption in Bloomsbury life will include special guided tours of Charleston and Monk’s House, a walk along the old coach road to see Bell and Grant’s spectacular murals at Berwick Church, and an invigorating yomp over the Downs to the Rodmell home of Virginia and Leonard Woolf. We will visit Duncan and Vanessa’s graves at Firle Church, admire the John Piper stained glasswork, and find Virginia’s first cottage, Little Talland. Discover Tilton’s stories and secrets from the rarely-explored archive as you become an official ‘Tiltonian’, as associates of the House were called. You will have some time to yourself each day to bask in the stillness and magic of the beautiful grounds. Explore Lydia’s garden, scribble away in the writing shed, relax in the hammocks and outdoor sauna, stretch out in the secret yurt or enjoy a knockabout on the tennis courts where Tiltonians played with gusto (but by Lydia’s account, very little skill). Your stay will conclude with a special torchlit procession as the sun sets over the Downs, past the winding chalk paths where Keynes’ ashes were spread, and up to the top of Firle Beacon, where breathtaking views and a candlelit banquet awaits. We’ll wind up the gramophone as the stars come out, share food, wine and stories, and end the night learning Tilton’s very own ‘Keyne Keyne’ dance. 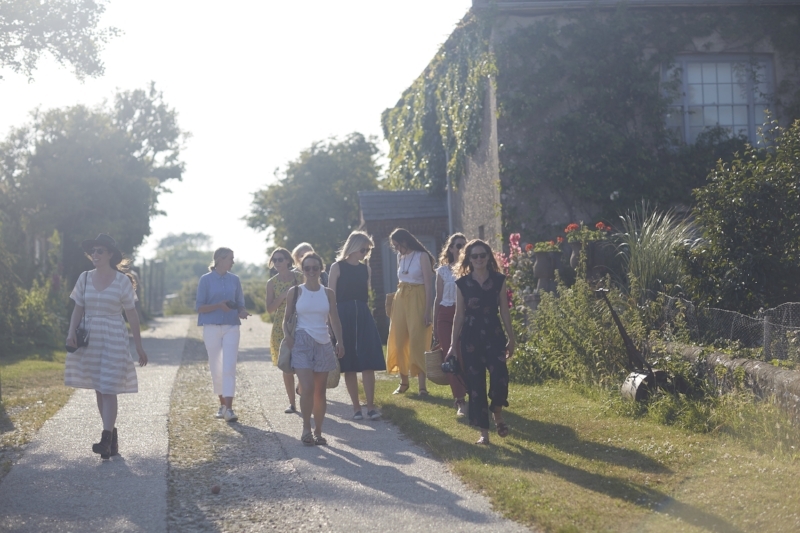 Exploring the importance of community and friendship is at the heart of this retreat, as we celebrate and learn from the creativity and nourishment the Bloomsbury set gained from the rich kinship of their network. Run by the Department of Wellbeing, the Bloomsbury Retreat is designed to invigorate and inspire every aspect of our physical, intellectual, creative and social selves. As the still centre where Lydia’s restless physicality and Keynes’ world-changing intellect found balance with one another, Tilton House is the perfect place to get your body and mind working together. You will leave this immersive experience with fresh air in your lungs, new ideas in your notebook, and with insights into the Bloomsbury group that few have had before. *Transfers are not included, wine is available at an extra cost. We will gather in Maynard’s Library to introduce the plan for the week ahead and explore some of the stories and ideas behind the retreat. Opportunity to share your Bloomsbury journey, interest and questions. Our suppers will be inspired by recipes and ingredients in the Bloomsbury Cookbook. Gather for drinks around the fire in the Library as we read from the letters between Lydia, Maynard and their Bloomsbury friends, discover untold Tilton stories and tell a few of our own stories too. 9.30am Walk in the Bloomsbury footsteps over the fields to Charleston, where you will be treated to a special tour of the house and have free time to explore the gardens. 1.30pm Weather allowing, we will walk up the Downs to the top of FirleBeacon, exploring the routes Maynard would take to do his best thing, passing the place where his ashes were scattered, and pointing out sites of Bloomsbury interest. We will explore the role the area played in the creativity and wellbeing of the group, read about this from their diaries and letters, and share our own insights too. If the weather is too inclement to walk, we will enjoy the same discussions in comfort at Tilton. 7.00pm Dusk walk to Charleston, looking for badgers and barn owls, as we make our way to a night at the Small Wonder Festival. 7.45pm Small Wonder: Stories of Resistance This event, featuring David Constantine, Kit de Waal and Cathy Galvin, reflects on the role of literature and life story in documenting protest and resistance. It is interesting to think about this in the context of the Bloomsbury set at war, from Duncan Grant’s conscientious objection, Woolf’s war-weary suicide, the death of Vanessa Bell’s son and the artwork at Berwick Church. 1.30pm Travel to Monk’s House in Rodmell, the home of Virginia and Leonard Woolf. We will have a tour of the house, then gather in the gardens by Virginia’s writing shed to read extracts from the diaries and letters about Lydia and Virginia’s friendship. 7.45pm Small Wonder: Strange Offsprings This event with Mark Haddon and Alison MacLeod explore the creativity of the Bloomsbury group and celebrates the 100th anniversary of the Hogarth Press. Haddon and Macleod have both written stories in response to Charleston and the Hogarth centenary, which will be available to read at Tilton before the event if you wish. After leaving Tilton, we recommend exploring the local village of Firle, where you can visit the graves of Vanessa Bell and Duncan Grant, the John Piper window in the Church and find Little Talland, the house where Virginia once lived. You may also enjoy a walk from Firle up to the top of the Beacon and around the Downs. Good walking shoes/ wellness - the fields around here are now quite wet. Walking trousers and a raincoat would also be useful. Comfy footwear to wear indoors. Any medication for allergies - there are two cats at Tilton.